News item one. Intent Filter can contain several actions. By doing so Activity notifies us that it can perform several actions. For example, not only viewing an image but also editing it. Activity can approach different Intents with different actions. News item number two. Activity which has been invoked using Intent has access to this Intent and can read its attributes. That is, Activity can find out which action was used. 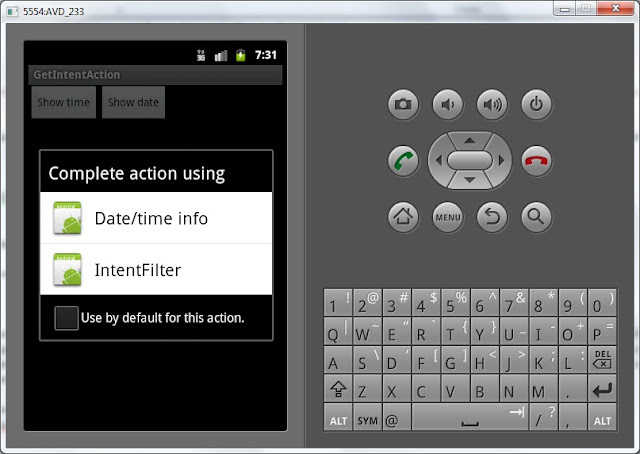 We will do the following: create an Activity and configure Intent Filter for action = ru.startandroid.intent.action.showtime and action = ru.startandroid.intent.action.showdate. By doing so we specify that Activity is capable of displaying both time and date. Later we will create an intent with action = ru.startandroid.intent.action.showtime or with action = ru.startandroid.intent.action.showdate. They will both invoke one Activity. And for Activity to know whether to display date or time, we will be reading action from Intent and define what to show for each action. Okay, we will start implementing it and everything will be clear. Code is also completely the same as in the previous lesson. 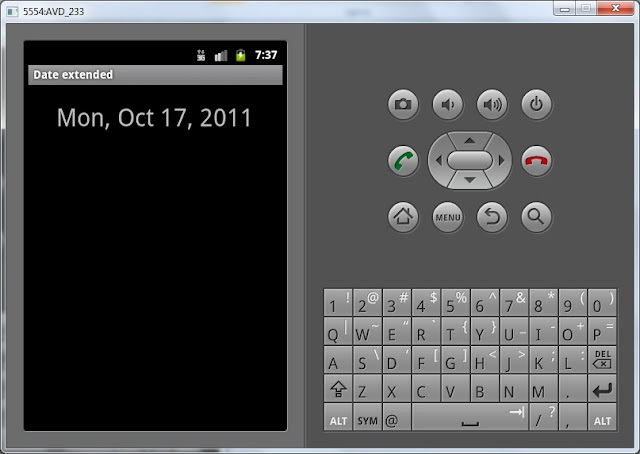 Define buttons, assign a listener - Activity and invoke an Intent on button click. Let’s now create an Activity that will catch both these Intents. We have only one TextView on the screen. Create an Activity, name it just Info. We receive Intent using getIntent() method, read action from it and depending on its value we display text on the screen. Don’t forget to register new Activity in the manifest and create Intent Filter with two actions and a category. And specify a label - Date/time info. Intent Filter of Info contains two actions. It means if the Intent with any of these actions comes - the Activity will be invoked. Save everything and run the application. The system gives us a choice. 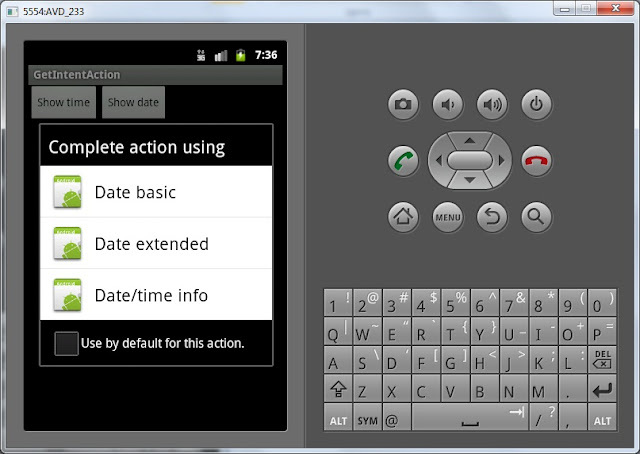 That is, Intent with action = ru.startandroid.intent.action.showtime found two Activities that fit. The one that is Date/time info is the one we have just created, everything is clear with it. The question is where does the second item with name IntentFilter comes from. Answer - this is ActivityTime from the previous lesson. It is named IntentFilter because we have not specified a label in the manifest for this Activity in the previous lesson and the system displays application name by default. If the system haven’t displayed a choice dialog, that means that you didn’t create the application from previous lesson or you have created a new AVD, or there is a mistake in your code. We have figured out that one Activity can be invoked using Intent with different actions. Activity can read action and perform the required operations. We have also made sure that Intent looks for Activities in all applications in the system. In this case it found Activity from the application that we developed in the previous lesson.